Suddenly Buck started, shocked. He wasn't on the lawn anymore. Chris, Casey and JD were gone. He paused, blinked at the blue sky above his head, the brilliant sunlight warming his body, which was no longer wracked with pain and exhaustion. Then he nodded; of course, he'd passed out, this was all a dream. Yep, that was it. Well, might as well enjoy it, he thought, sitting up and looking around. Yeah, it was a dream all right, there was Sarah and Chris' ranch in the near distance, just as it was before the murders, smoke curling lazily from the chimney, horses trotting in the corral. Buck chuckled; he had no idea he had such a great memory, everything looked perfect, right down to stuff he'd forgotten about, like the two rain barrels by the water pump. He stood up and brushed himself off, amazed at how strong he felt; like a youngster again, he thought as he surveyed the area. The hills were thick with vibrant green grass and wildflowers, their heady scent wafting through the air. Buck took a deep whiff and smiled. Damn, it even smelled the same. How the heck did he remember that? He looked around at the rolling hills, the gently waving fields, the dazzling sunshine, and vaguely wondered how long it would be before he woke up. There was so much to say to JD, to Chris, before he went for good. He tried to wake himself up, and failed; but then, he realized, he already felt wide awake. In fact, he'd never felt so aware...now that was odd. Even in the most vivid dream he could remember, there was always that weird feeling that it wasn't really happening. But this felt like it actually was. As he contemplated the situation, he saw someone walking towards him through the tall waving grass. He leaned back a little and sighed patiently, crossing his arms, deeply curious as to where this dream was heading. It was sure a corker so far. As the figure slowly neared, Buck felt an odd sensation come over him, a warm prickly feeling of recognition. He felt his face go slack with surprise, thinking, Dang, now I know this has got to be a dream. The figure walked at a leisurely pace, as if time meant nothing. Buck felt a surge of something rise in him, an oddly happy excitement he couldn't explain. Dang it all, he thought. Well, of course it wasn't really Ezra, he was dead. It was a dream, had to be, or a hallucination brought on by the smoke and pain. The last time he had seen Ezra, the gambler was lying on the hot desert floor, his body pierced by several bullets and weakened by the ravages of tuberculosis. He had been dead and buried for several weeks now. But the man coming towards him, dressed in a familiar red jacket Buck had thought he'd never see again, and a well-known black flat-crowned hat, his hands casually stuffed into his pockets, sure looked like Ezra. "Mr. Wilmington," said a familiar Southern drawl which wafted gently over the meadow, "how delightful to see you again." Buck was speechless; boy, did this seem real. As Ezra finally reached him, Buck saw how healthy he looked, the pallor of sickness and suffering gone without a trace. In its place was a relaxed, pleased expression, a look of genuine joy at Buck's appearance. There was something else different too, something Buck couldn't put his finger on. But the last thing Buck was going to do was let on how confused he was; he was not about to let a hallucination get the best of him. He smiled and gave Ezra a friendly whack on the shoulder. "Hey, Ezra, you ol' hustler," he laughed, trying to sound coherent, "you look pretty good for a dead guy!" Ezra chuckled, lowered his head and shook it. Then he looked up and smiled, the sun glinting off of his gold tooth. "You look fairly chipper yourself, sir, for one in a similar condition." Buck still smiled, but was growing flummoxed. "Uh, come again?" Ezra stroked his pursed lips, trying to be tactful. "You, Mr. Wilmington, are, ah-no longer of the world, as they say." Buck blinked. "You sayin' I'm dead, Ezra?" "Would you be talking to me if you weren't?" was the amused reply. The other man's expression fell as he regarded Ezra with all seriousness. "This ain't a dream? Or a hallucination?" Ezra lifted his eyebrows a little and shook his head, his face wreathed in sincerity. Buck stood still for a moment, taking it in. It all seemed so incredible, but he somehow knew it was true. He looked again at Ezra, still amazed; the other man chuckled again at his friend's expression and gave him a pat on the shoulder. "Don't worry, Mr. Wilmington, you'll get used to it, trust me. Shall we go in?" He began to walk away towards the house. Buck still wasn't collected. "In?" Ezra looked back at him. "To the ranch. I understand you used to frequent this place quite often-at least that's what Mrs. Larabee keeps telling me." Buck's head snapped up, the strange feeling of excitement returning. "Sarah?" His companion cocked an eyebrow. "Unless there was another Mrs. Larabee Chris didn't tell us about." The mention of Chris' name caused Buck to start; he'd left Chris, and JD, and the others. But they still needed him, especially JD, the kid was going to get himself killed without Buck around to help him. Ezra seemed to notice his look of concern, and walked back to him, placing a hand on Buck's shoulder and eying him solemnly. "Are you quite all right, Buck?" Buck gave a small nod, noticing that Ezra called him by his first name. "Yeah, just thinkin'-see, uh, a lot's happened since you, um-well, since then, y'know?" Ezra dropped his hand, looked away, then back at Buck. "As a matter of fact I do, sir." "Yeah, thought so," Buck said quickly, "an' it just struck me that Chris an' JD an' the others, they got a long road to travel yet, an' us not there to help 'em out." Ezra stood still for a moment, gazing at the ground in thought, then lifted his eyes to meet Buck's. "Mr. Wilmington, despite our surroundings, I must assure you I know as much about our friend's fate as you do. But I can tell you that there will be a purpose behind whatever their future holds. " Buck nodded-that sounded like it made sense. Then he sighed, still a little frustrated. "Yeah, but you know JD, Ezra-he'll shoot himself dead if I ain't there to watch him!" Ezra chuckled. "If he does, Mr. Wilmington, I will let you have first crack at him. But I believe he may surprise us both." They began to walk towards the house, and Buck marveled at the scene around him-it was just like the ranch, but much more real somehow, saturated with a simple beauty that cast a glow through everything in sight. He grunted and shook his head. "An' I told JD there wasn't a Heaven!" Ezra smiled a bit. "There are many names for where we are, Buck-and this is hardly all, I might add." Buck saw someone emerge from the house, a slender blonde woman who lifted her flowered skirt and carefully strode through the tall grass to meet them. Buck had often heard of after-death reunions with dead relatives, but wrack his brain as he might he didn't recognize this girl. She seemed happy enough, though, and darn pretty to boot, he thought as he studied the wide smile lighting up her face. She reached them, holding out one hand to Ezra; he took it, grasping it firmly, and faced Buck with a beaming expression. It was then that Buck realized what it was that was different about Ezra, far beyond the absence of any signs of illness. He looked honestly happy; there was a light in his eyes Buck had never seen before, even on the best days they had spent together. And he knew it wasn't just the presence of the pretty young woman-it was where they were. Buck wasn't sure how this was all going to work out, but he looked forward to finding out. "Mr. Wilmington," he said lightly, "pray allow me the honor of introducing my cousin and best friend, Sophie." Buck nodded, smiling. "Charmed, ma'am." "I'm so pleased to meet you, Buck," she said, returning his smile. "Ezra's told me all about you, of course." Buck shot a startled look at Ezra. "Well, I hope we'll be friends anyway, ma'am." The gambler laughed. "Don't worry, Buck-there are some things even I wouldn't tell a lady." They crossed to the front yard and mounted the steps. As they did so Buck saw two figures emerge from the front door onto the porch, a young brown-haired woman holding the hand of a small boy, who seemed consumed by excitement as he jumped up and down. Buck broke into a huge smile, then charged up the steps and scooped the boy up in one energetic gesture. The boy broke into squeals of laughter as he wrapped his small arms around Buck's neck. Then Buck caught the young woman's eye; he expected a huge wave of guilt to consume him as he gazed at Sarah, but it never came. Instead, he felt a flood of forgiveness so overwhelming it almost knocked him over. He seemed slightly dumbfounded as he stared at her, thinking how beautiful she still looked, smiling in the summer sunlight. She reached up and gently kissed him on the cheek, then took his hand and led him into the house. As they crossed the threshold, Buck looked back at Ezra and gave him a wide smile. "I think I'm gettin' used to it," he said, as they disappeared through the door. Ezra chuckled, extended his arm to Sophie; she took it gladly, and they followed the others inside. He laughed a little to himself and shook his head, dragging one hand through his shaggy black hair. He just couldn't get over it, that this was all real. Any minute he expected to wake up on the smoky lawn in front of JD's house, wracked with pain as his life seeped through the gaping holes in his chest. He thought for sure he'd see Chris' haggard face, lit by the dancing flames, watching in agony as another life was torn from him. It seemed too incredible that the pain was over, and that the anguish in Chris' eyes would one day be extinguished. Life didn't work out that way. Well, not that life, anyway. He tilted his head, observing that the sunset had deepened to a breathtaking array of gold-tinged pinks and purples, much like before but more intense. As he scanned the lawn he noticed Ezra sitting on the grass, hat in his hands, watching the sunset. Buck straightened, jammed his hands in his pockets, and ambled out to him. For some reason he felt the need to talk. Ezra turned his head slightly at Buck's approach, his expression amused in the gentle purple light. "A tad overwhelming, isn't it?" Buck jerked his head in agreement. "Boy, you can say that again. It ain't nothin' like I expected." Buck stretched himself out on the grass beside Ezra, leaning back on his hands. Ezra waited until he was settled, then looked at him. "And what did you expect, Mr. Wilmington?" His companion thought for a moment, then shrugged. "Aw, I don't know-y'always hear about clouds, an' angels flyin' around, an' harps an' stuff like that. But this-" He looked around. "Shoot, Ezra, this looks just like the territory!" Ezra smiled a little and nodded. "But does it feel like it?" Buck paused, then very slowly shook his head. "No. No, it don't." He sat silent for a moment, then looked up. "Hey, Ezra?" Buck rubbed his nose, hoping he could get this out right. "Look, back when you-uh, I just never got the chance to say thanks for warnin' us that Fowler's men was about to ambush us. We all woulda been killed if ya hadn't, an' with their guns trained on you, you musta knowed they was gonna kill you for it. That took a lot of guts." The other man shifted a little, and Buck saw him look down at his hands for a moment, his expression very somber. "Buck," Ezra said quietly, after clearing his throat, "while I appreciate your gesture, it is you who must accept my gratitude. I am quite convinced that, were it not for the friendship of yourself and our comrades, I would not be-" The words caught in his throat; he swallowed, then looked at Buck, his eyes shining in the fading light. "I have always measured a venture's success by its gains, Buck, and the profit of our association for me far outweighed any loss, no matter how severe." Buck regarded him silently for a few moments, then nodded. "I know what you mean, pard. We made a heck of a team." His partner looked thoughtful as he directed his gaze back out towards the dazzling sunset. "We still do, sir. The fight is far from over." Ezra shifted a little, watching the sky as it turned a deep violet. Buck didn't like what he saw in Ezra's expression. "Ezra, is somethin' goin' on I don't know about?" The other man looked almost sad as he turned his eyes to Buck. "Oh, you know about it, Buck. You just might not realize it yet." Buck was about to say something else when it suddenly hit him. He stared at Ezra, dumbfounded. Ezra saw the look on his face and nodded, answering the question in his eyes. Ezra looked away. "I'm afraid so." There was a pause, then Buck shook his head. "Naw, now c'mon Ezra, Chris couldn't take that an' you know it. Not me an' Vin too. He's gonna need him." Ezra turned his eyes back to Buck. "Mr. Wilmington, I fear there is nothing we can do to alter events. Mr. Tanner made his choice-one I would have expected him to make, I might add-and we can only wait to learn its purpose." Buck was still confused; he looked around. "But-he ain't dead, is he?" "We'd know if he was," came the thoughtful reply, as Ezra stared at the blue-purple sky. Stars had begun to appear, more brilliant than Buck had ever seen them. "But I fear either way, the rest of the journey will be difficult, for Chris and the others." Buck blinked, wondering that he didn't feel as angry or upset at this as he would have expected. It was just like Ezra said, he knew somehow that there was a reason this was all happening, even if he couldn't fathom what that reason could possibly be. He only knew it would all work out. He sighed. "Dang, Ezra, this does take some gettin' used to, don't it?" "Ain't there anything we can do?" The other man paused, then turned to him, his eyes glittering in the soft starlight. "We can lend them our strength, and wait. I'm afraid that's all. But we should know soon enough-time doesn't work quite the same way here, I've discovered." Silence fell again as they sat in the gathering night. Buck thought of JD-poor kid, he's probably scared to death, first Ezra, then me, now Vin. He knew that whatever Fowler had in mind was going to be hell, for JD and everyone else. But JD had Casey-she would help him through whatever was coming, even if Buck couldn't. Maybe whoever was behind all this could help them a little, too. But Buck felt he knew who was behind it, and that was why he felt it would all work out somehow. It was a very comforting feeling. Buck stood up and brushed off his pants. "I don't think it's quite Vin's time, Ezra." "I agree, Buck," the other man said, rising as well as he gazed at the sparkling sky. He sighed. "Still, we must be prepared. There are dark times ahead for Mr. Larabee and the others, and they may have need of us in the very near future." They stood in the dark blue twilight for a moment. Buck began to feel oddly discouraged-if only they knew how this was all going to end up, this pain and violence and suffering. Even here, it seemed futile and confusing. What was it all for, anyway? Suddenly he realized someone was coming towards them across the front lawn, a slim shadow approaching with a relaxed stride. As it came closer Buck saw it was a young man, his thick black hair gently lit by the summer moonlight. For one awful second Buck thought it was JD-dear lord, he thought, they got him too, those bastards-but then he realized that he'd know if anything happened to JD. The kid was safe, for now anyway. But this guy sure looked like JD-a little taller perhaps, more muscular, and the eyes were a soft brown instead of a light hazel. The face was a little different too, wider and more handsome than JD's boyish features. "Good evening, boys," the man called as he neared, in a strong, pleasant tone. Ezra nodded; he seemed to know the kid. "Good evening, Mr. Dunne," the Southerner replied, extending his hand. "I wondered if you would be by before you left." "Well, I had to meet Buck, didn't I?" the man laughed, shaking Ezra's hand, then proffering his own towards Buck. "Good to meet you, Buck, I'm William, William Dunne." Buck grinned and reached for the stranger's hand, thinking, must be JD's father or something. But as soon as their hands met, another realization struck him, so staggering that he started a bit. He stared at the young man, who seemed patiently amused at his consternation. Buck became aware that they weren't really shaking hands; he was just holding the youth's hand in a motionless, stunned grip, regarding him with wide eyes. Dimly he heard Ezra chuckle. "I believe he is pleased to make your acquaintance, Mr. Dunne." William laughed again, and Buck shook himself, slowly breaking out in a grin of amazement. "I'll be danged," he breathed, finding his voice. "I'll be danged !" And he pumped William's hand with great enthusiasm. "You're JD's son!" "Soon, anyway," William replied, deriving a huge amount of delight at Buck's excitement. "I just wanted to thank you for saving myself and Mama, Buck. That took a lot of courage." Buck dropped William's hand and shrugged. "Aw, I ain't no hero. Just got too much regard for that starry-eyed pa of yours to let 'im get hurt that way." William nodded, his soft brown eyes serious. "I know, Buck. And Papa knows, too. He won't forget you, you'll see." Buck drew himself up in mock insult. "Well, he dang well better not, or I'll just have to send a few li'l ole lightning bolts down to zap his ungrateful behind." The younger man smiled, but didn't lose the serious light in his eyes. "I'm sure that won't be necessary, Buck. My father owes too much to you-" He looked at Ezra, too, which seemed to embarrass the gambler slightly-" To all of you, to ever forget what your friendship meant to him. He's got a lot of rough days ahead, and the memories of the time you men spent together will be one of the things that helps him through them." They stood silently together for a moment, then Ezra cleared his throat. "Mr. Dunne, do you know something we don't?" William shook his head. "Only that you men were brought together for a purpose, which is still being played out, and that Papa's journey is far from finished. But I think he'll make it." Buck chuckled a little. "You can bet on that,son-JD's almost got himself killed a hundred times over, but I suspect he's got enough dumb luck to keep goin' for a long while yet." William nodded. "I hope so, sir. 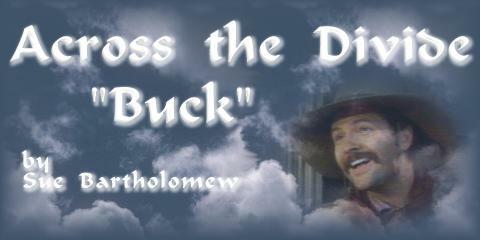 Now I've got to get going-nice to meet you, Buck, I'll be seeing you both again." He shook Ezra's hand, then Buck's. "Say, son, " Buck said suddenly, "can you do me a favor?" The young man smiled. "Can't rightly say, Buck. But if I can, I will." Buck tilted his head a little, his expression quiet in the silvery moonlight, and Ezra heard him blow out a deep sigh. "You just...take real good care of that pa of yours. He's one of the good guys." A small smile crept across William's lips. "I sure will, Buck. Good-bye." He gave a small wave and walked away, the soft light shining on him as he crossed the grass and disappeared into the velvety darkness. Buck watched him go, then sighed again. "If that don't beat all, Ezra," Buck said quietly, shaking his head. "JD's son." So that was what it was all for. Well, that made sense. Buck couldn't be there for JD anymore, but William could. The Seven would live on after all, even if they weren't seven anymore. Ezra smiled and clapped his hand on Buck's back. "I believe, Mr. Wilmington, that we may rest assured. The future seems to be in capable hands." They stood for a few more moments in the warm summer night, then turned and went into the house.